Leaving behind a media frenzy at home, U.S. Secretary of State Hillary Clinton arrived in Astana, Kazakhstan's flashy, newly constructed capital in the Central Asian steppe, to attend a meeting of the 56-nation Organization for Security and Cooperation in Europe (OSCE). The summit, the first of its kind since 1999, is considered a watershed moment both for the U.N.-affiliated organization as well as Kazakhstan, which has held the OSCE's chair for the past year. Ahead of the conclave, which began on Dec. 1, advocacy groups urged the U.S. and its Western partners to push authoritarian, former Soviet bloc states like Kazakhstan on their questionable rights records. Clinton duly obliged, declaring on Nov. 30 to an audience at a university in Astana, "If you want to be a successful country in the 21st century, eventually you are going to have to accept that you must do more for human rights." But she probably could have done with less free expression closer to home. Clinton arrived under the immense, bulbous cloud of the WikiLeaks controversy, in which 250,000 leaked diplomatic cables exposed internal State Department correspondence not intended for public consumption. A few missives conveyed frank (and not altogether charitable) American observations of German Chancellor Angela Merkel and Russian President Dmitri Medvedev  both of whom were in attendance at the OSCE summit. And the potential awkwardness for Clinton hardly ends there. Her Central Asia trip takes her from Kazakhstan to the neighboring states of Kyrgyzstan and Uzbekistan  all countries where the U.S. is keen to expand its influence and all countries discussed with either scorn or a healthy dose of skepticism in various U.S. documents released by WikiLeaks. One dispatch that can't have pleased those in power in Astana chronicles the "lifestyles of the Kazakhstani leadership." The country, rich in minerals, oil and natural gas, is the wealthiest and most developed of Central Asia's five former Soviet republics, but its long-standing ruler, President Nursultan Nazarbayev, is dogged by accusations of corruption in his ranks. The leaked cable describes in detail Nazarbayev's lavish personal ranch with "approximately forty horses from around the world" and notes his ambition to cultivate a luxury resort on property gifted to him in Turkey. It also describes a night when Nazarbayev's Prime Minister allegedly danced drunkenly (and alone) in a nightclub, and recounts a private birthday party thrown for the President's son-in-law headlined by Elton John. Not surprisingly, another leaked cable, dated April 22, 2009, pours cold water on a Nazarbayev-led anti-corruption drive. It says that most independent analysts within the country "see the campaign simply as evidence of a power struggle among elite groups within the Kazakhstani government and doubt that any of the 'biggest fish' will be affected." Still, that cynicism for politics as usual in Astana hardly matches the disdain heaped on Tashkent, in Uzbekistan, in 2007 by the outgoing U.S. ambassador in that country. In a dispatch released as part of WikiLeaks' Afghan war logs, leaked earlier this year, the envoy doesn't mince his words: "Uzbekistan does not pose all that complex a picture. It is a post-Soviet police state run in the interest of a small coterie of families who monopolize political and economic life." Yet Uzbekistan is also a state that Washington has desperately needed on its side in its fight against Afghanistan's Taliban, farther to the south. Sensing opportunity, the country's notoriously dictatorial strongman, Islam Karimov, curried particular favor with the Bush Administration before a brutal 2005 crackdown on protesting civilians in the restive Ferghana Valley compelled Washington to dial back its support. The U.S. had higher hopes for Kyrgyzstan, a sparsely populated, mountainous country that has hosted a pivotal U.S. air base since 2001. A people-powered movement, quaintly dubbed the "Tulip Revolution," unseated an autocrat in 2005 but ultimately replaced him with another one. A coup early in 2010 led to elections and what now may be the region's first legitimate parliamentary democracy. But throughout, the U.S. has had to open its checkbook in order to keep Bishkek friendly and its strategic base open. A particularly intriguing document released in the new cache of cables tells of a Feb. 13, 2009, meeting between the U.S. ambassador in Bishkek, Tatiana Gfoeller, and her counterpart from Beijing. Gfoeller confronts the Chinese ambassador, Zhang Yannian, with evidence from Kyrgyz officials that China offered Bishkek $3 billion if it would boot out the U.S. military presence on Kyrgyz soil. Here's Zhang's reaction, as narrated by Gfoeller: "Visibly flustered, Zhang temporarily lost the ability to speak Russian and began spluttering in Chinese to the silent aide diligently taking notes behind him. Once he had recovered the power of Russian speech, he inveighed against such calumny, claiming that such an idea was impossible." According to the cable, Zhang goes on to helpfully suggest that the $150 million a year the U.S. gave to Kyrgyzstan, often as structured, development-driven aid, should just be given "in cash." What does it all mean? As with most other WikiLeaks "revelations," we learn little that was not already intuitively known by experts in the field. The governments of Central Asia are all riddled with corruption and eager to play bigger powers  Moscow, Washington, Beijing and even Tehran  against one another. In Astana, Clinton dismissed the impact the leaks may have on future U.S. diplomatic efforts. But at the very least, the cables offer a glimpse of the tricky tightrope the U.S. has to walk in the region  eager to exert something of a moral agenda while also playing a tacit chess match with China and Russia in a part of the world where cynicism and realpolitik are very much the rules of the game. 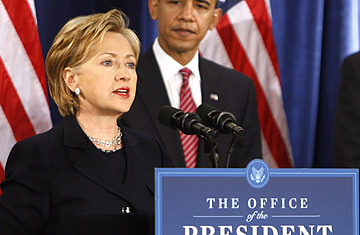 WikiLeaks may not hurt Clinton, but a humbled and chastened U.S. diplomatic corps still needs all the help it can get.